eGenix PyRun™ combines a Python interpreter with an almost complete Python standard library into a single easy-to-use executable. Now with Python 3.4 support ! 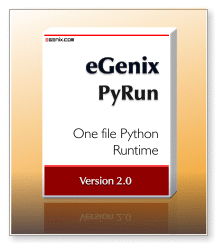 eGenix PyRun™ is our open source, one file, no installation version of Python, making the distribution of a Python interpreter to run based scripts and applications to Unix based systems as simple as copying a single file. eGenix PyRun's executable only needs 11MB for Python 2 and 13MB for Python 3, but still supports most Python applications and scripts - and it can be compressed to just 3-4MB using upx, if needed. Small footprint: only about 11 MB in size for Python 2.x and only around 13 MB for Python 3.x. Can be compressed to just 3-4 MB using upx. Python 2.6, 2.7 and 3.4 Support: PyRun works with all popular Python versions. We chose the single source approach for achieving this, but had to drop Python 2.5 support as a result. Compatible with setuptools, easy_install, pip: Great care was taken to make sure that PyRun can be used with setuptools et al. Please note that these tools are not designed to be relocatable. Python 2 can be built as narrow Unicode version (UCS2) or wide Unicode version (UCS4). For Python 3, there is only a single UCS4 version. The include/ directory is only needed in case you want to compile Python C extensions. It is available as part of the prebuilt binary distributions we make available.